Tate Martell has been part of his share of memorial nationally televised wins during his three years at Bishop Gorman. But the Ohio State-bound senior sensed that Friday night’s showdown with Florida powerhouse St. Thomas Aquinas at Fertitta Field might be the biggest of them all. “This game decides what legacy we leave at Gorman,” Martell tweeted out Wednesday night. That legacy could now very much include an unprecedented third consecutive national championship after the No. 1-ranked Gaels (6-0) pulled out a dramatic 25-24 triple overtime victory over the ninth-ranked Raiders (3-2), who began the season as USA Today’s top-rated team in the country. Biaggio Ali Walsh took a pitch from Martell, lowered his shoulder and powered in off left tackle for a two-point conversion to win it for Bishop Gorman, which extended its winning streak to 45 games. None of those wins had as many twists and turns, not to mention hard hits, as this one. “This is the greatest win ever,” proclaimed Bishop Gorman coach Kenny Sanchez afterward. Aquinas, which had allowed a total of just six points in its three previous games and fielded a defense loaded with Division I prospects including Notre Dame-bound linebacker Drew White and Tennessee defensive tackle commit Kivon Bennett, held Bishop Gorman’s high-powered offense to just a 24-yard Derek Ng field goal over the first three quarters and took a 7-3 lead early in the third quarter thanks to a trick play that saw wide receiver Mike Harley take a reverse lateral and then connect with Ohio State-bound wide receiver Trevon Grimes. The Raiders, cheered on from the sidelines by NFL Hall of Famer Michael Irvin, had a chance to take control of the game early in the fourth quarter but Harley was intercepted in the end zone by safety Bubba Bolden, his second pick of the game. The Gaels then answered with an impressive 80-yard, 10-play drive capped by a perfectly thrown 16-yard pass from Martell to junior tight end Brevin Jordan to take a 10-7 lead with 7:35 remaining. 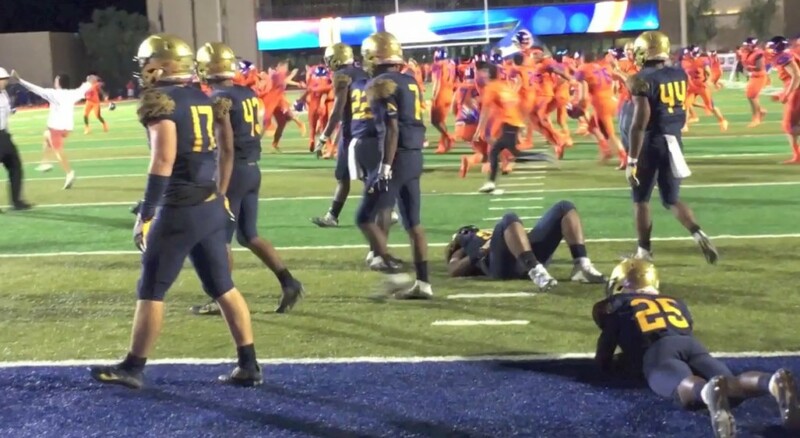 But after the teams traded possessions, St. Thomas Aquinas, aided by a questionable pass interference penalty, drove to the Gorman 7-yard line where Marco Salani nailed a 25-yard field goal as time ran out to tie it, 10-10, and send the game into overtime. 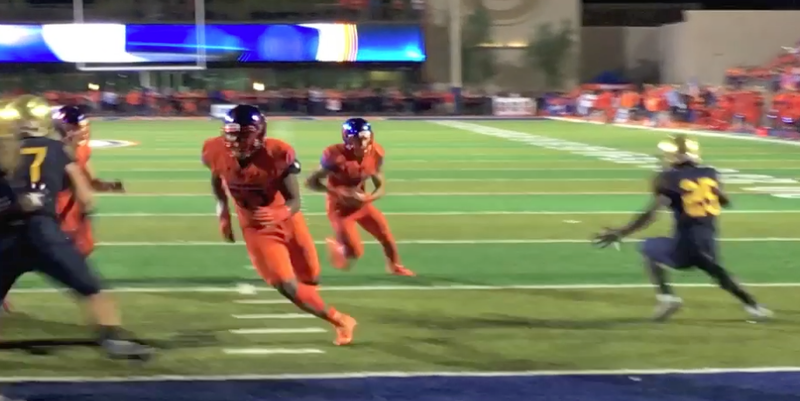 On the first play of overtime, Florida-bound quarterback Jake Allen hit Jordan Merrell with a 10-yard touchdown pass to put the Raiders ahead, 17-10, but Gorman forced a second overtime when Martell hit junior wide receiver Jalen Nailor on an eight-yard slant on fourth down. That was just the first big “whew” moment of extra time for the Gaels. 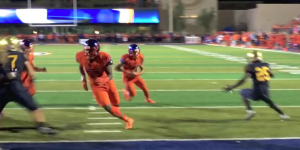 Gorman had possession first in the second overtime and went for it on fourth and inches and fullback Farrell Hester was stonewalled by the Aquinas defensive line. That meant all the Raiders needed was a short field goal to win it on their ensuing possession. After a pair of short runs by tailback Mike Epstein, the Raiders sent Salani out on third down for the win. But a hard-charging Bolden leapt high over the line (SEE VIDEO HIGHLIGHTS) and managed to get his hand on the ball just enough to narrowly keep it from going over the crossbar. Aquinas regrouped and took a 24-17 lead in the third overtime on a one-yard run by Epstein. Then on its first play, Gorman closed to within 24-23 when Martell hit Nailor again on a 10-yard slant. Sanchez sent out Ng to attempt a PAT to likely force a fourth overtime but Aquinas was flagged for encroachment before the try moving the ball inside the 2-yard line for the conversion. That’s when Sanchez elected to roll the dice and go for two and the win instead, and Ali Walsh, like his famous grandfather, Muhammad Ali, delivered the final knockout blow.